Looking out for Best Wood Router Reviews? To be frank, there are many router options which you will find, and all of them offer pretty much the same. It is necessary for you to decide your needs of wood router before buying any. What are you looking for in your top rated wood router? Is it value of money, size, portable, easy to use? There are many such options which will definitely confuse you in buying decision. The right tools make an efficient artisan! Wood Routers help with trimming and shaping of the wood. They are strong built machines yet easy on the handling part. You can use it as a plunging tool, or set it up on the inverted table. 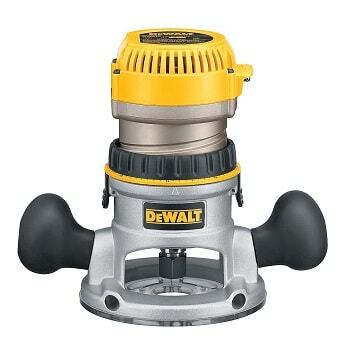 DEWALT Router is our personal favorite of all! It is the best wood router for the money. They have got 1.25HP motor running which makes all the processing quick and efficient. With the variable speed options, you could choose from a variety of speeds and set it according to the work. Set the depth and make precise adjustments on this router. Most of the Wood Routers take longer time when it comes to motor and bit settings. 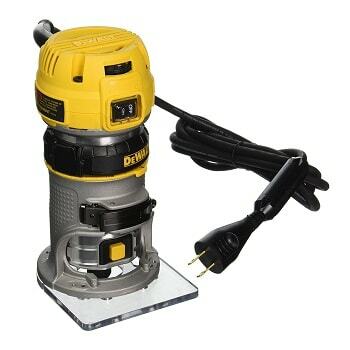 But things are different on this DEWALT Variable Speed Router. There is a feature called quick motor removal that allows you to get all the base and bit changes done in very less time. This router has got a speedy motor that helps you out in dealing with the toughest of the tasks. You just have to set the right speed as per the work, and it will get the job done for you at the right time and efficient way. The speed range with a no-load state falls in the range of 16000-27000 rpm. It comes with a dual LED that makes the working more visible to the users. Thus, you can carry out the inspection, and do a check on the working at any moment. There is a plunge base utility that sets the required depth for routing. The Multiple Shaft-Lock allows you to get the bit changes and related work done quickly. Here the base release tabs come with spring-loaded connections, so this makes the removal quick and effortless. While one drawback found here is the routine factory service that needs to be performed after every 100 hours. Also, the brushes does not stay for a long time, they quickly wear out. Get the best plunge and base cutting with the Bosch 1617EVSPK Router. You can try out dados and other beautiful patterns on the wood with this machine. Their variable speed feature allows you to set the desirable speed which matches with the work. 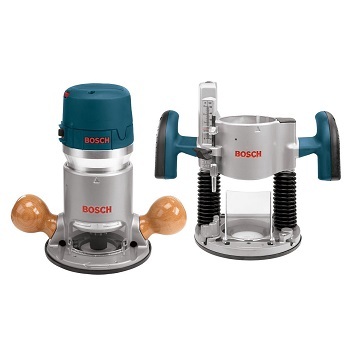 This Bosch router offers you with a speed range of of 8000 to 25000 rpm. This choice of using variable speed is of one of the major benefits of wood router, as you could opt for the best optimal speed for the job. Constant Response Circuitry helps the router with maintaining a constant speed throughout the cut. 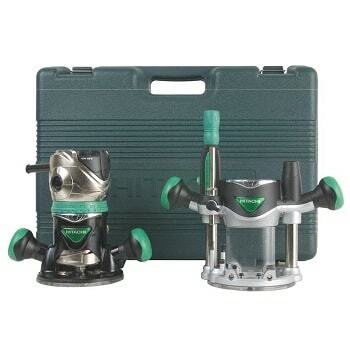 You are aware that this product is a complete kit, which included both the plunge and the fixed base routing. There is a special depth adjustment feature called the Micro-fine, using which you can set the required depth. It is made available for both the plunge as well as the fixed base. Then comes the Quick Clamping, and with this you can transfer the motor between the bases. It allows to have quick conversion without the need of any additional tool. Find out our tips for wood router, and make the process more efficient than before. Checking out the handles, they are comforting and makes the holding easy. Another feature we saw is the height adjustment, and using this you can set the required height for this routing system. Here the machine is built using durable materials, so they will stay for a long time. However, we came across certain design failures relating to the mounting section. There is a pin which travels along a small slot provided, but it falls down vertically after traveling for a short distance. 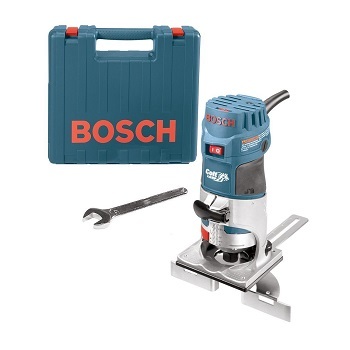 Comparing it with other machines, this Bosch model is one of the best router that you can get in this price range. This router has got a nice palm grip and runs on variable speed. Then you have the Soft Start function that reduces the initial torque produced during the start-up. With the rpm speed of 15000-35000, you can perform almost any routing for any kind of surface. Finger support pockets are included for the ultimate user comfort! Then, you have the Depth Adjustment with which you can set your desired length for routing. It offers a robust performing router with the horsepower of 1.0 – it is an outstanding value for a small router system. Setting the router at the right height is important for the overall routing efficiency. Micro-fine adjustments are possible with the help of the wheels located behind the router's base. This feature mainly deals with all the height and other depth adjustments. Find out - what does a wood router do​? Click to read more. Speed dial is placed on the top portion of the router making it easily accessible. The palm-shaped grip allows single handed operations on this router machine. With the Quick Clamp mechanism, you can quickly change the router from one base to another. Other important components that come along with the main router machine – case carrying the router, user manual, shaft wrenches for installation, a guide for getting the straight edge, etc. 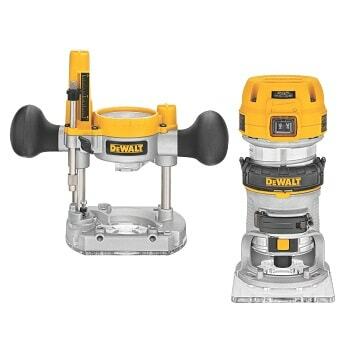 You can buy DEWALT Compact Router as a single machine or as a part of one complete router kit. This machine combines intense power, easy handling, and innovation. It can come to your use for a variety of operations ranging from a small bevel cut to heavy profile cutting. With a horsepower of 1 and 1/4 rating, it will provide you with an incredible power and work output. It features dual LED that offers you with great router visibility. There is this variable speed setting, using which you can try out different speeds and choose the one that best suits your work. Here the motor has a slow-start feature and is able to maintain the same speed throughout the cutting process. As we already mentioned about the dual LED setup on this, you also get a clearer sub base that makes all the processing clear to the user. The machine has two tabs which help with the quick release of the base, and the other one is for the new base design. Because of these tab options, you can easily handle the motor location and maintain it for all kinds of applications. On a standard base, this router can travel about 1.5 inches in depth. You can make use of 1/4 inch collet for maximizing the surface on this DEWALT Router. The elements included in the package – router, LEDs, standard base for the setup, user manual, wrench. It arrives with a super warranty of 3 years period. Well, ​some users have reported about the depth adjustment problem. As a solution, it is recommended to connect the base clamp firmly with a socket. If you are confused, then get in touch with a professional and bring out the solution. ​This is a 12-ampere support Combo Router machine. A combo router features both fixed and plunge bases. Other advanced features like 2.25 hp power, integrated dust control, and others makes the handling simple for you all. The 2.5 HP rating is found to be pretty sufficient for working on all the high-end surfaces. On the plunging end, you will get 5 adjustable positions that makes all the repeated plunges more simple than ever before. Well, it is fact that handle is an important factor on any machine. Comfortable handles help with bringing the best accuracy for all the routing work. The sub-base and the other base features are designed in such a way that users can make quick changes in the base and bit settings. You will get a cool 3-years warranty on this router, so make the best use out of this! Only products made with durable and quality materials offer such amazing warranty policies. Wood cutting and the basic routing operation is ought to generate a lot of dust particles. For the same reason, the makers have included one dust-sealed switch that prevents the dust ingestion. So, even if you are busy with your work the machine will do some maintenance by itself. What’s in the package for you? Basic Router, fixed base, plunge base, 1/4 and 1/2 inch collet, sub-base, vacuum adapter, wrench, and one kit with additional tools. 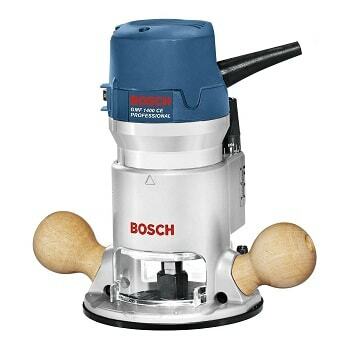 There is almost no routing job that you can't do with this Bosch Variable Speed Router. They make use of 2.25 horsepower and runs on a 12-ampere motor. Here the RPM speed falls in the range of 8000 to 25000, which is really cool considering the model and the price. With the variable speed setting, you can choose the speed that matches your job. This not only helps with effective routing but also gets the job done on time. Here the base is made of aluminium, and so it is here to stay for a long time. They also include a soft-start feature on the motor part, which offers less torque at the start of the machine. This helps you as well as the machine to better understand the environment and makes it smooth with the handling. You can set the bit in the center portion of the sub-base, and make the bit positioning more easy. The Quick Clamp setup helps with easier conversions, and this allows you to change the motor between two bases more quickly than ever before. A few users got the router delivered with missing parts. Another issue reported is relating to the variable speed function that rises by itself as soon as the router is initiated. We have the Hitachi Variable Speed as our next recommended Speed Router. You can change the base quickly, and they also arrive with all depth adjustments on it. Though the motor is powerful, it makes very less noise during the operation. This machine can help you with cutting, trimming, groove cutting, pattern shaping, etc. Quiet motor, easy base changing, quick depth adjustments – all these features make it a must-have machine for all the workshops. They offer a rpm range of 8000 to 24000 speed on a no-load setting. Also with a varying load, you can adjust the rpm accordingly and get the best work performance. It does not make noise while operation, and this reduces the machine vibrations. This eventually allows the user to have effortless routing time. The electronic speed control allows you to set the machine in the way you wish it to run! First know the speed required for the work, and then accordingly do all the settings. This speed router is compatible with 1/2 and 1/4 inch bits, thus it can come to use for almost all basic workshop needs. These bit sizes are the standard ones used in all the workshop setup. We read that collets included with this model are low on quality, and are easily breakable. If the model is within the warranty, then you can request for the collet. Brushes does not last for a quality time, and needs to be frequently renewed. So, these were the problematic issues found with this router model as of now. Another performance router which is compact in design and offers you with a range of routing uses. 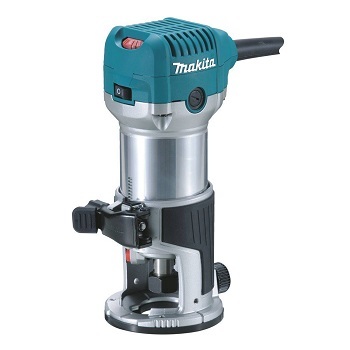 Makita RT0701C is best wood router for beginners. The ergonomic designing helps with smooth handling and also makes it easy for the beginners to start on this. Compact quality itself adds up so many benefits, like easy handling, portability, less space required, and many more. Along with the plunge base, there is an offset base that allows the user to work on the corner ends. With such settings not only you get to do smooth angled routing, but it also makes it easy with the working. Compact and ergonomic design helps the user to handle the machine smoothly and maintains the right control. One of the basic features to look out for in any router is the Horsepower. Here the horsepower is around 1 and 1/4. This is found to be average for the Routing kind of work. Still, it will offer you wonderful routing results. They have got this soft starter which runs with the AC power, and this reduces the workload during the start of the machine. Control Dial for the Variable speed allows the user to choose the right rpm from the range of 10000 – 30000. So, select the right rpm range that matches your need. Users mentioned about the machine getting hot within short usage time. Also the quality of the button on the plunge base is pretty low in quality, breaks down easily. With a superb 3.25 HP horsepower, you can deal with different workpieces keeping the rpm range between 8000 to 21000. This is easy to set up, and also the functions are simple to understand. Other features included in this are single button operation for changing the bases, height adjustments on the rack and pinion, etc. Micro Winder allows the user to continuously make height adjustments in the fixed plunge setting. With the help of the removable plunge spring, you can adjust the height settings while the table is mounted. Also, the guarding portion is fully enclosed that protects the user from the cut zone. There are some air-vents provided on the sides, that help with reducing the dust intake (that may occur while it is mounted in an upside-down position on a router table). If you are ordering this device online through Amazon, then there are other components that come along with the main product. These include – fence for multi-purpose uses, 1/2 inch collet, 1/4 inch reducer, and finally a collet wrench. The single button for changing the base is one of the main highlights here. Only a regular user will understand the comfort and importance of having quick adjustments on a compact router. Other features like the variable speed and the soft start allows you to get the perfect settings required for a particular routing job. It is a bit on the pricier side compared to the other Wood Routers on the list, but they will be worth each penny. 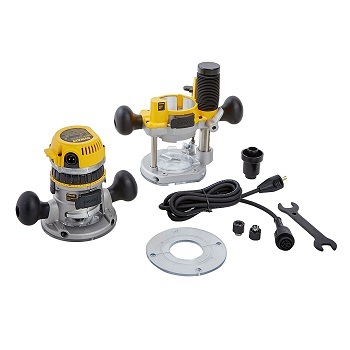 This 1 – 3/4 horsepower router can help you with smoothing as well routing purpose. Micro-fine is the style of height adjustment present on this router model. The steel motor is adjustable and comes with the cam lock – it makes the depth adjustments and base changing quicker than ever before. Here the motor runs on an 11 amp power and offers the right versatility and durability required for a standard routing job. The Lexan sub-base is clear in view, and gives you the right visibility. This allows you to make use of the standard template guides for the variety of routing works. With a quality motor and standard horse-power, you can tackle almost all the hardwoods available in the market. This makes it a versatile router, which can deal a variety of surfaces. There is one dust-sealed switch which protects the machine against all the dust ingestions. It comes with the nickel motor housing, that guarantees you with a durable running system. With the inclusion of cam lock and other motor latches, you can get all the adjustments done quickly and even get the base changes done smoothly. Another point to note here is that the makers have considered the design seriously, and has made many operations easy for the users. They come with 3 years limited warranty that covers up all the machine faults and similar issues. On starting up the machine, the router produces some noise that is comparatively higher than the other router machines. So you may be required to wear some ear protection during working with this router. 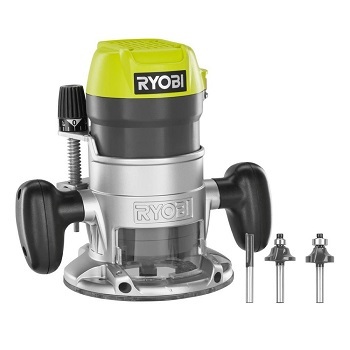 We have the Ryobi Corded Router on the list, and it's a pretty good choice you can opt for. They make use of an 8.5-ampere motor and has got a 1 – 1/2 horsepower. Strong built and the quality components offer you with an efficient and long-lasting machine. Getting into the design and construction of the base, they are built using die-cast aluminum. Thus, be assured of the quality that you are going to deal with. As soon the product is delivered, you can get started with the routing since they arrive with the 3-piece router bits. In this manner, you don't want to wait for a second! Keep the router started as soon as it is delivered. Here the rpm can go as high as 25000, and it offers you with quick and precise cuts. Chip Shield keeps the user protected during the routing process. You can set the correct depths and do the required adjustments with the Micro-fine depth setting. Spindle lock makes it easy with the bit changes so that you can do it with fewer efforts. Here the motor is securely held with the Cam-lever, this is important while performing the routing work. We have got the Green and Black combination color model in this Ryobi Corded Router. The design is a classic one and will look good among all the other tools in your workshop. Handles have been designed keeping the user comfort in check which makes the routing job less tiring. Starting with the basic definition of the machine that we understand from the name itself. It is a machine that can rout the unwanted portions of the wood, thus giving it a unique and classic design altogether. This mainly falls in the woodworks and other carpentry field jobs. But because of the versatile nature of it you can make use of it as a plunging tool, while some of them can be set in an inverted style on the table. We will now quickly list out all the basic yet high-end tasks that can be performed while you use﻿ a Wood Router. Look out for frames, desks, doors and the edges – which will give you the ideas in which router can come to your help. You can try out multiple holes on the wood surface, and bring out the creativity in you. If you are a real Wood Router enthusiast, then you could get amazing designs and cuts on the plastic, and even on metal surfaces too. You can shape, trim, and get all the unwanted wood pieces removed with the routing process. This is the basic use of this machine, but it is not easy as they sound. Back in the old days making a drawer and the matching boxes were not this easy. Now, with a wood router, you can make drawers by yourself at home. Things are easy with the invention of the router. Want to try out new patterns for the wood project? Now you can work on different edges of the wood, with the help of Wood Router. In order to get perfect edges, make sure that the bits are sharp as it depends on the routing efficiency. This comes under the maintenance of the Wood Router. Another work that you can try out is the Dado. To get the shelf set on the side of the cabinet, you will have to make a Dado on the wood. It is a square walled surface which is cut out along the surface of the wood. Here the channel created is called a groove. First, you need to have the right bit that matches the required dado design. Next popular woodwork is the Rabbet Cutting. They are similar to the long rectangular cut pieces, which are then later joined with another matching hollow portion to make a closed structure. These are the first of the basic wood joints that are taught to the beginners. You need to get the Rabbeting bits to try out the rabbet cut on the wood. You can try out the Inlay Banding, which is a technique of decorating the wooden pieces. Here small pieces of different wood, veneer, strands of wire, parts of marquetry are attached to the main wood project. To get started with this, measure the main wood structure. Then you have to make a rabbet cutting after doing all the measurements. After you have cut the recess portion, simply glue it up and join the pieces. We can try out the Dovetail design. You will require some tools for getting this woodwork done. The dado must be 3/4 inch wide so that you can set 3/4 inch guide bushing to travel along this for making the dovetail cut. So, these are the various tasks and other wood patterns which you can try out using a Wood Router. Now we will get into the guide where we will discuss how a beginner should get started with this amazing tool. Wood Router can come as a great help to you since they can be used for a variety of wood works. Most of you guys can only recall the fancy stuff which can be cut/made using this device, but in fact, there are many other works like the dado and the rabbet cuts which is possible with the help of a Wood Router. Are you a beginner? Then this piece of information will help with getting started. If you want to learn the Wood Routing, then it is obvious that you need to have a Wood Router at hand. We will go through the step by step guide that a beginner must follow to working with a Wood Router. It begins! There are two types of router, one is the fixed base router and the other one is the plunge base router. In the fixed base one, you have to set a particular depth and it will maintain this depth throughout the cut. While in the plunge base model, the router machine stays flat on the surface and the bit plunges while the machine is running. After that, check the power ratings of the router. 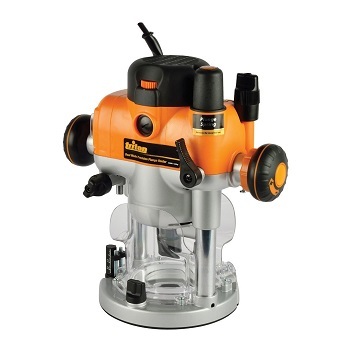 Router machine with the horsepower in the range of 1½ and 3½ will do great for any kind of wood router (fixed or the plunge base). We hope that you have fixed the type and decided on the power rating. Then check the weight, and most of the router weight falls in the range of 7 to 11 pounds. So, lift the router by your hand and check if it can be lifted by you. Go ahead with it, and choose the product that does not cause any strain on your hand. There are many parameters can be added to the list, like one of them is the Cost. Each consumer will have a fixed budget, so go for the machine that is the best in your budget. What if you are not able to set the router bit in the right manner? Our Wood Router won’t come to any use in that case. For precise routing, it is important that you get the right matching bit for the type of the job. So, for getting the best cut and profile design, it is important that the router bit is set firmly on the router. Only then the bits will rotate smoothly, and offer you with the same design as you wished for. In both the router types, you will come across one component named collet. This is the element which allows you to make use of a variety of wood bits for different wood cutting purpose. So, understand your need and then look out for the bit that matches your need. A cove bit, Dado bit, Rabbeting bit, Roundover bit, etc, are some of the many examples that are used for the Wood Routing. So, if you want to make a Dado cut, then get the suitable Dado bit and set them up with the collet. Similarly, with the help of the round over bit, you can make rounded profiles on a square edge on a wooden piece. This is one of the crucial property which will decide the resulting wood design. We didn’t want to sound negative here! But this is the truth. Depth factor depends on various things like the bit used, HP of the machine, and also on the type of the wood you are working on. For this, you must strictly follow the user manual and set the depth as mentioned for your Wood Router. To get started, get a sharp bit and set it up on the router. Begin the routing, and you will find it rotating in an anti-clockwise direction. Make sure that the bit pushes the router towards you and not in the opposite direction. You will note that the routers have the least support on the corner side. Just keep the router handle on the wood surface for bringing some control. Now you are familiar with the basic definition of a router, it is used for cutting, smoothing, working on the edges and doing all crazy and creative stuff which can be done on a piece of Wood! That’s the simplest way of defining it. If you want to make a bench or table, then you can try out the rounded edge for a change. This is one of the trending designs which people have been trying out lately and has been widely accepted too. If you are planning to carve numerals like the house number or any business logo on a wood, then you can make use of a Wood Router for this purpose. These are the raised panel doors which you will find in all the major cupboards. You won’t find a bookshelf without this panel design on it. They are the common yet elegant designs which are adopted by many of the artists. The bevel is one of the types of shaping and adjusting the edges of a frame. If you want to make a frame for yourself, then the edges must have to be trimmed and shaped. This process of shaping the edges is called the Bevelling process. In this, you have to work on the inside as well as the outside of the frame. Do you need an explanation for this? A simple cutting board can be designed at home if you have a router in hand. Cutting boards are the flat, wooden/plastic surface on which you can cut the veggies with keeping a support. So, they are the basic uses of a Wood Router. It all depends on your creativity and expertise. You can add as many routing ideas and works in the above list. Share us your ideas and routing projects that you have carried out in the comment space below. 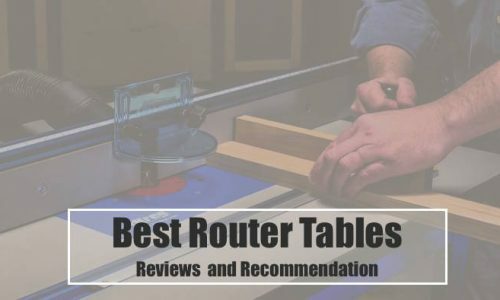 Was this Best Wood Routers Reviews helpful? Did this article answer your query, and was it all worth the time and energy? Let us know your feedback by commenting below. For more updates, follow us and visit our website.